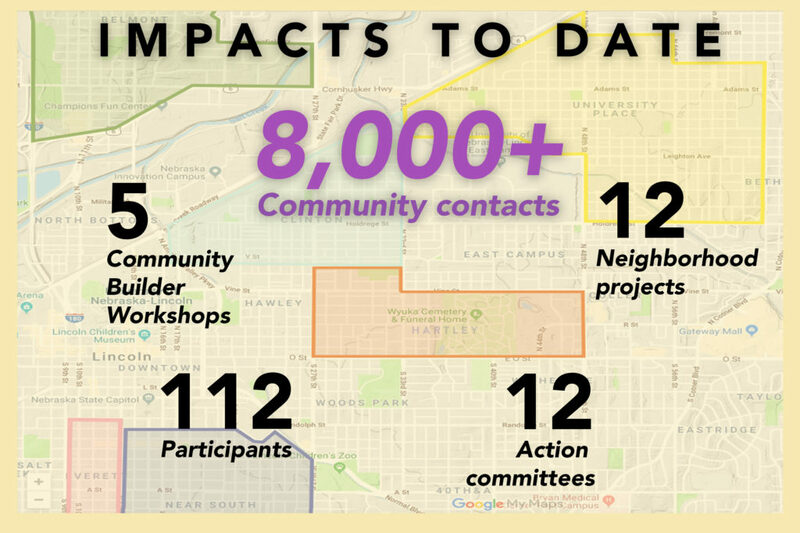 Collective Impact Lincoln's 2018 Canvassing Report highlights themes and trends from the group’s first two years of deep canvassing and community listening sessions. Residents of a half-dozen historic Lincoln neighborhoods say they enjoy the quality of life in their communities, have a firm sense of place and access to educational opportunities. But they also highlighted the challenges of making their communities more vibrant with better housing, reliable transportation, and steady employment prospects. On April 17, Collective Impact Lincoln released its 2018 Canvassing Report, which highlighted themes and trends from the group’s first two years of deep canvassing and community listening sessions. Since its inception in 2017 via a Breakthrough Initiative Grant from Woods Charitable Fund, Collective Impact Lincoln has focused on six city neighborhoods – Belmont, Clinton, Everett, Hartley, Near South and University Place. Nancy Petitto, Collective Impact Lincoln’s program manager, said the new report brings residents’ likes and concerns into much sharper focus. “As we continue to widen our scope and deepen our data, we are seeing the nuances and complexities of our neighborhoods more clearly, not to mention the issues that affect residents’ lives most profoundly,” Petitto said. A partnership between Civic Nebraska, Nebraska Appleseed, and the South of Downtown Community Development Organization, Collective Impact Lincoln has made nearly 9,000 community contacts. At doorsteps and living rooms, at Farmers Markets and community events, canvassers have held deep conversations about what people like about their neighborhoods and what they feel needs to be improved. Based on those conversations, housing became the group’s first policy issue. The group has facilitated a grassroots campaign around housing affordability, hosting neighborhood forums and workshops to discuss the best way to address affordability and adequacy issues, and has activated and encouraged residents to share their housing stories with city leaders. “This work has not only helped inform city leaders and helped Collective Impact Lincoln take action on policy matters, but it has provided much-needed entry points for neighborhood advocates to make their voices heard,” Petitto said. Collective Impact Lincoln has made several recommendations to the Lincoln City Council to ensure living conditions in Lincoln are affordable and adequate, including adding additional resources to hire more inspectors to enforce housing codes. Collective Impact Lincoln also recommends city leaders reconsider the threshold to investigate complaints, including empowering inspectors to examine the interior of rental units as part of a regular system. Employment and jobs also emerged as a regular topic during canvassing. Residents shared information about their current job situation and how employment impacts their lives and the lives of those around them. Thirty-nine percent said their situation was good or very good, with 16 percent responding less positively. Regarding transportation, 35 percent of respondents said they were able to get around the city very well, with 19 percent saying less so. While access to bike paths and the city’s bus system were often mentioned, common concerns emerged about increases in traffic. To see Collective Impact Lincoln’s findings to date, click here.